Legendary horror actor Boris Karloff was born here. Description: Actor Boris Karloff (1887-1969), real name William Henry Pratt, was born not in the laboratory of a remote eastern European castle on a stormy night, but in leafy Dulwich into a respectable family of diplomats. Though famous for playing a grunting monster made of reassembled body parts, he was in fact a thoroughly well-spoken Englishman: mild-mannered, a keen cricketer and gardener. His birthplace is now a Turkish restaurant, with an entrance adorned by Karloffian memorabilia. 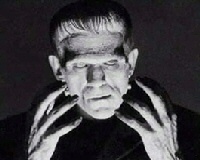 Karloff starred in as Frankenstein�s monster three times, in the 1931 original, �Bride of Frankenstein� in 1935 and �Son of Frankenstein� in 1939.